It’s the off-season, but it sure has been a busy week for college football fans as we followed National Signing Day on Wednesday and got excited to watch two first-round draft picks battle it out in Sunday’s Super Bowl 50. We watched the annual ritual of coaches waiting nervously by fax machines for Letters of Intent after weeks of visiting players and trying to convince them to choose their schools. 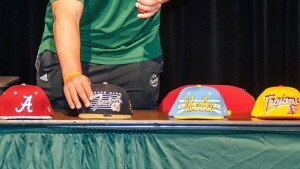 Those players held press conferences at their high schools, surrounded by their families, prep coaches and the standard baseball caps for the teams in contention (to add an element of suspense) on display. Fans checked the web throughout the day, fingers crossed and hoping their alma mater would snag top talents. We watched as some of these young men flipped on their earlier commitments at the last minute, a practice that has become so common that it surprises no one anymore. And, as expected, the traditional powerhouses reloaded with 4-star and 5-star prospects. Put simply, top teams win the national championship of recruiting by finishing the day with the greatest number of most highly-ranked players. Scout 300’s top uncommitted prospect was 5-Star Defensive Tackle Rashan Gary of Paramus Catholic High School in New Jersey, who was pursued by Clemson, Michigan, Auburn, Ole Miss and USC; he chose the Wolverines. Finishing the day most satisfied were fans of Alabama, Ohio State, FSU, LSU, Ole Miss, Michigan, UCLA, Texas, Georgia, and Florida. Whether these talents actually live up to the hype remains to be seen. Many of these young men commit to college teams with a larger dream in mind: Making a big enough splash in collegiate athletics to become drafted to play for the National Football League. In the six issues of The Kickoff that we’ll publish between now and July, we’ll look at these players and the NFL Draft. Subscribe now and you can get an extra email/PDF subscription for a friend at half-price. Just as some high school players won’t make it in college, many will fail to become NFL greats. This week the Cleveland Browns dismissed 2nd year quarterback Johnny Manziel, the 2012 Heisman winner who has faced legal issues and inconsistent play since leaving Texas A&M. It remains to be seen whether another team will take a chance on him. Elsewhere in the league, this weekend’s Super Bowl 50 marks the first time two quarterbacks taken No. 1 overall in the NFL Draft are going head-to-head. The Broncos’ Payton Manning was taken No. 1 in 1998 out of Tennessee, while Carolina Quarterback Cam Newton was taken No. 1 in 2011 out of Auburn. There is a 13-year age difference between the players, the largest in Super Bowl history, with Manning age 39 and Newton just 26. If the Panthers win and Quarterback Cam Newton is voted the game’s MVP, he’ll become only the fifth player in history to win the Heisman Trophy and Super Bowl MVP. The only four to do it: The Cowboys’ Roger Staubach in Super Bowl VI, the Raiders’ Jim Plunkett (XV); the Raiders’ Marcus Allen (XVIII) and the Packers’ Desmond Howard (XXXI). Newton has a chance to match Raiders RB back Marcus Allen as the only player to win the Heisman Trophy (1981), a national title in college (Southern California 1978,1979), the NFL Most Valuable Player Award (1985), a Super Bowl (1984) and the Super Bowl MVP (XVIII in ‘84). Newton won the Heisman in 2010 when he led Auburn to the college football championship and is the prohibitive favorite to win this season’s MVP. Newton has insisted that race is of no importance to the game, but it is worth noting that if the Panthers win, he would become only the second African-American quarterback to win a Super Bowl and be named the game’s MVP. Carolina coach Ron Rivera would become only the second Hispanic coach to win the Super Bowl. Manning, who led the Indianapolis Colts to a Super Bowl championship in 2006, will be making his fourth Super Bowl appearance. He has the advantage of experience and will be the sentimental favorite to win since he’s hinted this may be his final game. At Tennessee, he was SEC Freshman of the Year in 1994, 1997 SEC Player of the Year, Best College Football Player in the 1998 ESPY Awards, and recipient of the Davey O’Brien Award, Johnny Unitas Award, 1997 Maxwell Award, 1997 James E. Sullivan Award, and 1997 NCAA Quarterback of the Year Award. With the Vols, he led the offense to 11,020 yards. Manning was a runner-up for the Heisman in 1997, losing to Michigan cornerback and free safety Charles Woodson, who is still the only primarily defensive player to have won the prestigious award (Woodson played for the Raiders and the Packers, picking off Manning twice and retiring himself last December). While at Auburn, Newton won the Heisman, Maxwell Award, Walter Camp Award, Davey O’Brien Award, was AP College Football Player of the Year for 2010, and the Manning Award (named for Peyton’s and Eli’s father Archie — former Old Miss QB, and QB for the Saints, Oilers and Vikings). In his rookie year, Newton broke numerous rookie and all-time NFL records for passing and rushing yards. He became the first rookie quarterback to throw for 400 yards in his first game, shattering Manning’s first-game record by 120 yards. It will be interesting to see how these two football greats match up with such high stakes. In Sunday’s Super Bowl, Carolina is favored by 6 points. Super Bowl 50 will kick off at 6:30 ET on CBS.